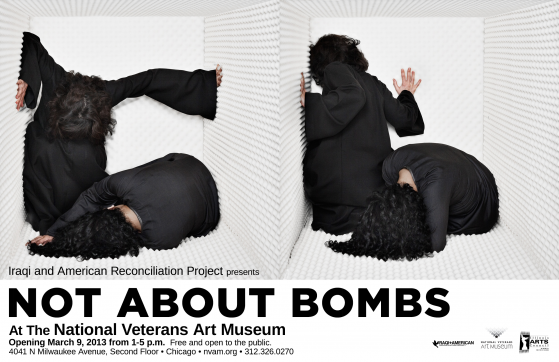 At the National Veterans Art Museum Opening March 9, 2013 from 1 – 5 p.m.
Curated by Tricia Khutoretsky, Not About Bombs addresses how a female perspective can fit into the modern context of turmoil and conflict through art and avoid falling into the typical ways that women are represented and misrepresented. The women in this exhibit contribute art that is visually and conceptually accomplished, but unpredictable and emotionally engaging. Because if anything, as a long, drawn-out, mind-numbing war comes to a “close,” emotional investments in Iraq are few and far between. This exhibit will not be what you expect. It is about war. It is about Iraq. But it presents contemporary art by Iraqi women to deliberately explore and challenge expectations. Dr. Savneet Talwar, Associate Professor School of the Art Institute of Chicago’s Art Therapy Graduate Department. Moderator: Johanna Buwalda, Director of Mental Health at VVAW Military and Veterans Counseling, Coordinator for The Soldiers Project Chicago, and clinical volunteer for the Kovler Center for the Treatment of Survivors of Torture and the Civilian Medical Resource Network. This entry was posted in Openings and Events and tagged art, Chicago, National Veterans Art Museum, Veterans. Bookmark the permalink.